I really didn’t think when I started this blog that the most interesting thing I’d have to talk about would be food, but when I stay in working most of the day, it becomes quite a highlight. And it’s been fun to cook–I never did much cooking when I lived alone. I always felt like I had a good general aptitude for cooking, and thankfully I was right. Yesterday, I tried my hand at making pasta sauce for the first time ever, and I was surprised by how well it turned out. I called my mom a few days ago to get her spaghetti sauce recipe and to see if it would work without meat in it. She said it was more in her head than anything else and suggested just sauteeing a bunch of vegetables in a pot then adding a few different kinds of tomatoes–canned, freshly diced, tomato paste, etc, then letting it simmer for a while and adding some herbs. I used mushrooms and onions and lots of tomato products, then spiced it up with garlic, basil and my mystery herbs, then added some spicy paprika to give it a kick, and it was great–chunky and saucy and went well with the penne I served it with. I also topped it off with some grated cheese (herbed gouda, I think), and some fresh basil. It’s nice to have time to cook. And now we have more leftovers. And a note on the fresh basil: When I bought the plant, it had two stalks and lots of leaves. Then it looked like the whole thing would die rather quickly. Now it seems that the larger stalk has killed the smaller stalk and it doing somewhat OK. Only a few leaves right now, but it’s all still green. Hopefully it lasts another few weeks. New culinary adventure: I’ve been trying my hand at making soup. Monday, I made garlic broth, though I think I should have put in some more garlic, and followed a recipe that had me poach an egg in the soup, which turned out quite well, considering I’d never poached an egg before. And being inspired by my soup from Klassz that had a poached egg, I was definitely more than happy to try my hand at it. Unfortunately, the recipe also called for putting dried bread in the soup, which I didn’t like at all–it got so soggy, I threw most of it out. I think I could have also used a bit more garlic–and I wish I would have added some other vegetables. I consider it a moderate success. Today, I went to the market–I actually found a new market that I didn’t know about at all. It’s just a few blocks away, and by a great import food store called Culinaris. I noticed a few people selling vegetables at stands on the outskirts of the park across the street, and I went over to take a look. There wasn’t a big selection–the vendors were packing up for the day. But I looked back across the street, where someone was opening a large wooden door, and lo and behold, I saw a whole display of fruit! I crossed back to the other side of the street and went in, and there was a large indoor market with about five different fruit and veggie stands, meat counters, a bakery and more. I bought some bread and a chocolate croissant at the bakery. Found some big Israeli avocados at a fruit stand, and bought a leek and an onion, thinking they’d be good in my next incarnation of soup. They were! I made broth from chopped up leeks, onions and garlic, and I seasoned it with salt and pepper and some spice I bought at the market–maybe tarragon? Evan had his broth plain, since he isn’t feeling fantastic, and I poached another egg for myself and added some diced tomatoes. Much better than the first attempt. 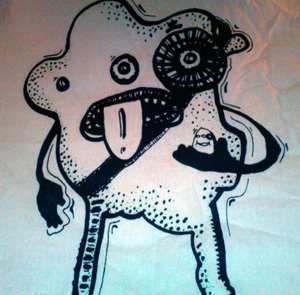 Also, I was excited that I got to carry everything home from the market in my new tote bag (pictured below–yes, it has a weird monster on it) that I got at Bolt–a small, quirky shop that sells art objects, T-shirts, accessories and more for the environmentally conscious Hungarian hipster. I’d been looking for a fun tote for a while since stores rarely give you bags here. 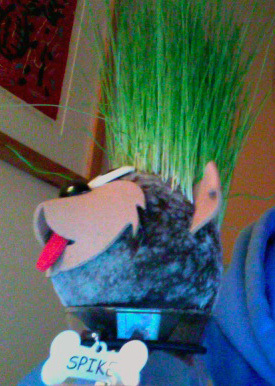 File this under sad face: Spike’s head is all moldy and I don’t know what to do. Suggestions are welcome. Is this the end of Spike? 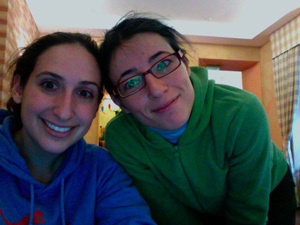 Awesome surprise while sitting in the lobby today: Miriam came to visit! She is in town from Barcelona, visiting Bernat. Well, it wasn’t a surprise that she’s in Budapest–she’s been here since Friday and we hung out on Saturday night at the wrap party–but it was still great to get to chat with her and have coffee together. She’s only here until, Wednesday, though. As if we didn’t do enough on Saturday, what with our big lunch and art fair excursion, Saturday night was the Hellboy 2 wrap party at Hemingway’s. There were snacks, some good chocolate cake and lots of dancing. The music was a fun, eclectic party mix that made me feel like I was at a bar mitzvah. They even played Hava Nagila. Seriously. There were tons of people there and we didn’t know a lot of them, since Evan works in the office and not on set, but it was good to see the people we did know. Of course, now, leave it up to me to get a bizarre but not serious injury–alcohol in my eye. We were on the dance floor when some Hungarian song came on, and the Hungarian crew went crazy. They were standing around in a circle, clapping and jumping up and down around a few drinks. One guy picks up one of the drinks like he’s going to take it as a shot and instead of downing it, either ends up spilling or throwing it–and a good portion of it landed right on me and Evan, including in my eye. Ouch! It stung! And to make matters worse, when I turned around, grabbing my eye, a drunk girl elbowed me in the head. And to only add to this brief moment of chaos, we were in the process of asking the photographer to take a picture of us, and he was still trying to set up and take the photo while I was temporarily blinded. Thankfully, Evan ushered me off the dance floor, I went to the bathroom and dabbed at my eye to try to soak up the strong drink and salvage my makeup, and we took a photo when we got back on the dance floor a few minutes later. All in all, though, great night. Saturday was just a whole great day, actually. Saturday, Evan and I stopped in to a restaurant on Andrassy that we’ve passed many times. It always looks good and inviting with it’s big windows and funky wallpaper, but we seem to always walk by too late. This weekend, though, on our quest for an early afternoon brunch, we decided instead to to take a long, leisurely lunch. We were seated at the first table in front of the door, which made us a bit wary. The night before, we’d had a pretty miserable experience at another restaurant, squished at a small table in front of the entrance and hitting the bar. But our table at Klassz worked out well–there was a purple and yellow curtain surrounding the entrance so we wouldn’t get a draft, and though most tables were full, the restaurant never felt overstuffed. Our table was charmingly quirky, just like the seemingly mismatched walls (Chew.hu has some photos you can check out). It had hot pink napkins and a lace doily that looks like something someone’s grandma made under the salt and pepper shakers. Actually, the whole bright and clean restaurant could be defined as granny-hipster chic. I was even inspired to walk all the way to the back, past the bar built of wine cases to the wine cellar that had three more tables set up. We started out with soup–I got potato cream with a poached egg and Evan got vegetable with ricotta ravioli. The big surprise was how the soups were served. The server brought our bowls to the table–mine with the egg and Evan’s with the ravioli–then poured the soup over our little prizes from individual copper pots. The potato soup was great, and I loved how when I cut open the egg’s yolk it added a shock of orange to the pale soup; the vegetable soup was good, but more standard. For the main course, I had vegetable risotto–a deliciously decadent, creamy and cheesy concoction with peas, spinach and carrots. Evan had rabbit on a tomato risotto–he said the meat was cooked perfectly and his portion was so big it looked like he barely touched the risotto, though I’m sure he had quite a bit. The best surprise of all was that toward the end of the meal, I realized that nobody in the restaurant was smoking. Everything smelled fresh and clean and there weren’t any ashtrays in sight–definitely different for a Hungarian restaurant and quite a treat for us Californians. What a great way to spend a Saturday afternoon. Next time we’ll have to save room for dessert!